For information about university admission, please visit the DAAD website. Bonn is known for its universities. It is a city for scholars and researchers. The ‘Alma Mater’, the main building of the University of Bonn, is located in the city centre, noticeable for its grand and graceful architecture. There are four major universities and colleges in Bonn and its surrounding areas. University of Bonn was founded on October 18th, 1818 by the Prussian King Friederick William III, who intended to establish a favourable reputation in the region as well as abroad. It is one of the ten largest universities in Germany. 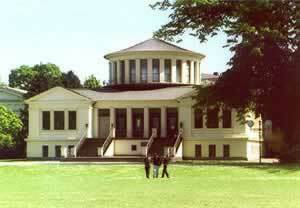 There are 38,500 students at the University of Bonn, of which 5,200 being foreign students from 140 nations. Foreign post-doc students and researchers participate in collaborations of teaching and research fields with over 1,500 projects internationally. KiEx. (Kirchliches Examen) -degree in Theology. University of Bonn collaborates with 55 other Universities in Toulouse, Warsaw, Prague, Florence, Jerusalem, Kyoto, and Waseda University in Tokyo. The largest university library is the ULB (Universitäts- und Landesbibliothek), which contains 2.22 million volumes of books and other materials. There are an additional 160 libraries from U of Bonn’s institutes, seminars and clinics. 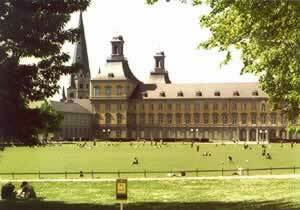 The Bonn-Rhein-Sieg College was founded on January 1, 1995. It is located in three areas of Sankt Augustin, Rheinbach and Hennef, bridging the River Rhine and the local region. Foreign Language courses in English, Spanish and Russian. Through collaborations with colleges and institutes abroad, the students have the possibility to study and conduct research at least one Semester in a partner institution internationally. Both Bachelor’s and Diplom degrees are offered.